The Vortex Diamondback 4-12x40 scope is no longer in production, but that doesn’t mean it isn’t a great riflescope. This scope has plenty of features that make it an ideal scope for most hunters. Vortex put a lot of detail into the glass and design of the Diamondback 4-12x40 scope. The Diamondback comes with multi-coated glass, it is a second focal plane scope; it is compact and efficient with its quick focusing features. The high-quality construction of this rifle scope makes it a solid purchase that will last through many hunting seasons. Hunters and marksmen looking for a medium range scope are going to love the Vortex Diamondback 4-12x40. It offers users crystal clear focus and unlimited parallax adjustment. Vortex is one of the better scopes for resetting your zero. The turret design of the the Diamondback riflescope has easily read markings. ​Let’s take a look at the tech specs to see what the Diamondback scope from Vortex has to offer. While the Diamondback 4-12x40 isn’t going to cost you an arm and a leg to purchase, it will still provide you with things you would only expect from a pricier scope. The optics are fully multi-coated. This multi coating of anti-reflective material helps to increase the light transmission that the scope provides. Each air-to-glass surface has multiple coatings of anti-reflective material. The coatings make sure that marksmen have the best light transmission available without target illumination features. The Vortex Diamondback 4-12x40 features a second focal plane reticle. The scale of the reticle will not balloon at higher magnifications. The listed reticle sub-tensions that are used for estimating range and windage are going to be accurate even at the highest magnifications. This makes it ideal for hunters that don’t want to have to make corrections in their head. The objective lens is adjustable on the Vortex Diamondback 4-12x40 riflescope. This feature of the scope allows the user to have an excellent image focus. The adjustable objective lens also allows for parallax removal to prevent blacking out of the target or aiming off target. Both waterproof and fog proof, the Diamondback is designed to keep your sights crystal clear. The waterproofing on the scope features O-ring seals to stop moisture, dust and debris from interfering with the performance of the riflescope. Vortex didn’t want to leave anything to chance so the riflescope features argon gas purging to prevent fogging of the internal glass through a wide range of temperatures. There are two reticle options on the Vortex Diamondback. There is a dead-hold BDC reticle and a V-Plex reticle. Each reticle provides a different set of advantages. Choosing the reticle that you are most comfortable with will enhance your experience when sighting a target through the Diamondback 4-12x40 riflescope. ​The Dead Hold-BDC reticle has a custom design that takes a lot of guesswork out of the corrections you make for windage and elevation. This customized feature makes it a better choice over the V-Plex reticle option for hunters and marksmen that shoot at varying distances, Especially shots where holdover could interfere with accuracy. The nice part about the turrets on the Vortex Diamondback 4-12x40 is that they are capped. This eliminates the possibility of a turret being accidentally adjusted. Also, the turrets allow re-indexing to the turret to zero after you have sighted your rifle. ​The turrets feature a zero-reset option. For marksmen that enjoy shooting at multiple distances during the day this feature is handy. The zero-reset feature makes it easy to get back to your distance demarcation line and then re-sight and compensate for the windage or distance. There are several construction elements that add to the quality of the riflescope. The first is the precision glide erector system. This system uses premium components to help make the zoom lens magnification changes easy even during difficult conditions. In addition to the precision glide erector systems, the Vortex Diamondback reticle offers a single piece tube. This construction from air-grade aluminum helps improve accuracy. It also enhances the visual performance of the scope. Single piece construction means less room for materials breakdown. The riflescope features a hard, anodized finish. The finish on the Diamondback scope is matte with low glare. This helps to conceal your positioning when taking your shot. The single piece construction of the outer tube also lend the Diamondback 4-12x40 a rugged reliability. Several Aspects of this riflescope make it a great buy. There are several good points to this riflescope. One of the better aspects of the Diamondback 4-12x40 is that it can usually be found for under $200. This price point doesn’t mean that it is a poor functioning scope. The Diamondback has been discontinued by Vortex, so the price is reflective of that. The zoom on the Vortex Diamondback is smooth, even when the conditions outside could cause other scopes to catch or jerk during their zoom. This lower priced scope doesn’t skip out on using higher-end components for construction. The Shock/Water/Fog proofing are all great elements on the Vortex Diamondback Riflescope. These features ensure that you are not going to break your scope when you are hunting in cooler temps or if you accidentally set it down too hard. Having capped turrets that allow you to reset to your original zero position is a big selling point on the Vortex Diamondback 4-12x40. The Dead-Hold reticle provides excellent sighting of the target with accurate demarcations that do not blur out your target. The reticle adjusts as you zoom enabling more accurate targeting. Multiple coats of glass treatment on all exterior optical elements increases light transmission through the scope. An adjustable objective lens allows for parallax removal which can mean the difference between a kill shot on an 8-point buck and telling your friends how you missed your shot. Unfortunately, this scope isn’t 100% foolproof. There are a few things that you should be aware of when you decide to purchase the Vortex Diamondback 4-12x40. No natural zoom on this scope means that you are going to have to work a little bit harder to sight your target through the scope. The scope is discontinued from the manufacturer. If you need replacement parts or service, it may cost more than it would, had you purchased a scope that was still being produced by Vortex. There are no sunshades available from Vortex for the Diamondback 4-12x40 scope. If you like to be able to use original equipment manufacturer accessories, you won’t be able to on this one. There are third party sellers who produce sunshades that fit this scope. Vortex even recommends a specific manufacturer. The maximum eye relief on this scope is relatively short at 3.1 inches. The field of view at max zoom is only 11.3 feet at 100 yards; giving you a small viewing window when sighting your target. 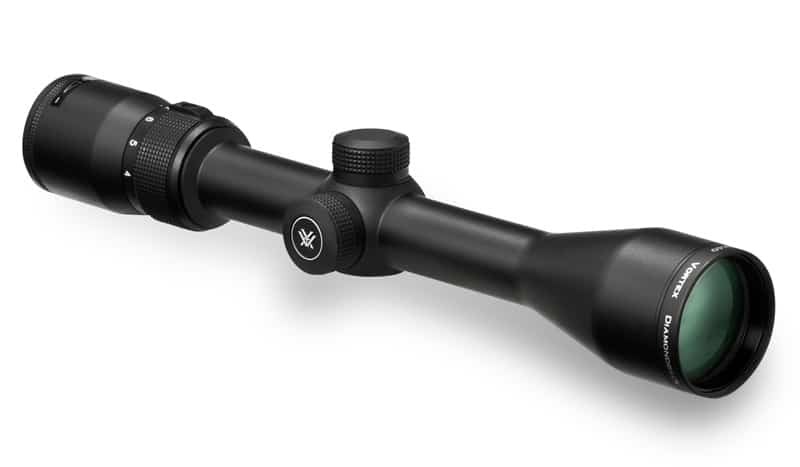 The Vortex Diamondback 4-12x40 is a good, low price point scope. There are not a lot of scopes that can compete with the quality of manufacturing that you see in this Diamondback. All the construction elements were carefully considered when Vortex put the Diamondback scope together. There are high quality elements that you won’t be able to find in scopes within the same price range. The magnification quality is superior because of the adjustable objective lens. The ability to remove the parallax gives you greater accuracy. The smooth magnification on this scope make it easy to sight your target without losing your target. While you aren’t going to be able to buy some standard scope accessories, like the sunshade, from the manufacturer; you won’t have the same need for them. Vortex used multiple coats of high end optical glass treatments. These coatings offer superior light transmission without target illumination. If you want a good quality scope that won’t let you down when it comes to the necessary elements, then look no further. The Vortex Diamondback scope is a great choice for any medium range marksman.